As a concept, the Tablet PC continues to find itself a niche device, best used for corporate and vertical markets, so it comes as no surprise the Toshiba Portégé M400 (£1350 inc. VAT) heads further down this line with a machine that is solid and robust, but with few frills. Finished in slate-grey plastic, you'll find magnesium-alloy has been reserved for the back of the 12.1-inch screen as well as the base. The panel is a digitised display that is used with an electronic pen for writing and annotating notes, as well as a host of other handwriting features using the Windows XP Tablet PC Edition software. The screen can be rotated 180 degrees and folded to hide the keyboard away, which is something of a shame as the keyboard, while small, is excellent. The keys may be a little close together, but they are firmly mounted and make for a smooth typing action. Powered by an Intel Core 2 Duo processor, you don't need to compromise on performance for portability, as we found this an impressive machine to use. Even after using it for long periods of time, the chassis remained cool to the touch. With 1024MB of memory you'll be able to load application with ease and while the 100GB hard drive isn't the largest on offer, it'll hold your important programs and files with ease. A biometric fingerprint scanner is built into the lid below the screen. Other key aspects of note are the use of a shock-absorbent hard drive, which will notify you if any sudden movements may cause harm to the disk, as well as the use of wireless broadband. Tablet PC devices are all about portability and the idea that you can connect regardless of location. So what really makes this an impressive device is the inclusion of 3G in the form of a Novetel Wireless Broadband card built into the machine. Managed by T-Mobile this is a great way to collect and send email when away from the office. If you want to connect using Wi-Fi, you'll find Gigabit Ethernet is installed. At 2.3kg, it's not the lightest machine we've seen, but we used it for long periods without too many problems. While the tablet mode works well, we found ourselves using it largely as a compact laptop and only resorting to the digitised screen when absolutely necessary. 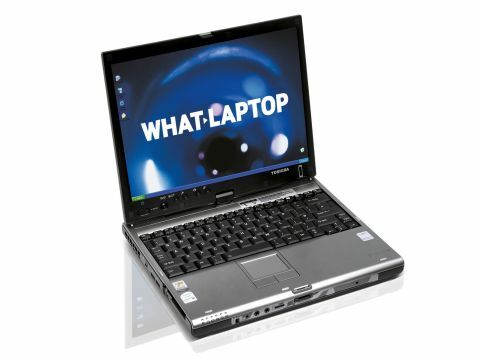 We were impressed with how versatile the Toshiba Portégé M400 was to use. This version may not be a great leap forward in terms of technology, but the addition of 3G makes it far easier to use away from the office and pushes the Tablet PC concept further ahead.